Tonight I unexpectedly nurtured my creativity by going prop shopping. I have some ideas for pictures this weekend and needed some different types of teas. I will, of course, have to taste test them as I take pictures! I was thankful to not have many crowds. I went straight from work, which helped, but by the time I was finishing up, it was getting noticeably busier. My favorite boy toy met me at the mall and we have a wonderful supper at the Cheesecake Factory. I got a flatbread pizza, with chicken added to it, and strawberries with whipped cream for dessert. It was decadent and a great way to finish the week. I stopped afterwards at Barnes & Noble and bought several books, including one on night photography. I love it when night photos turn out well and after my posting here, I definitely want to try more of it. 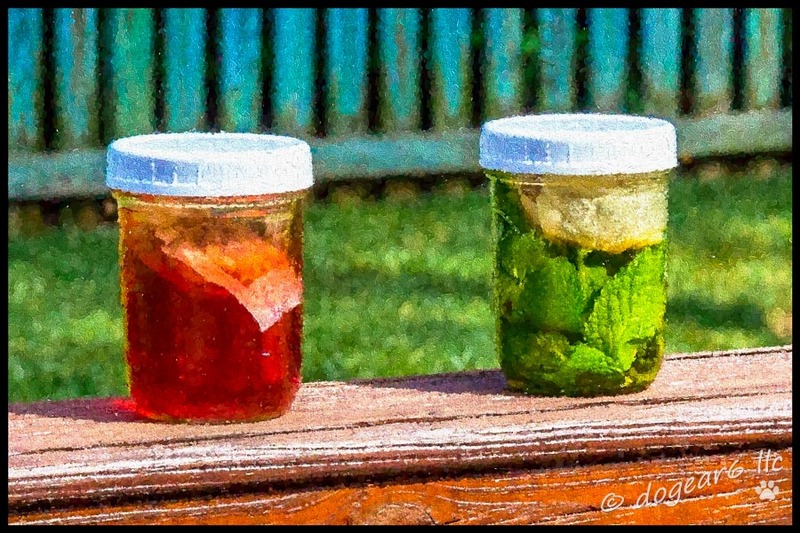 This is a picture I took earlier this summer of sun tea brewing on the deck railing. For instructions on how to make it, click here. The original photo is below, uncropped and unadjusted on the left; on the right is cropped and adjusted. It sure was fun trying it all out!! Isn’t it just the greatest??!! Oooh Sun Tea! If I could add 7 likes instead of one I would! Beautiful picture and it sounds like a great way to end the week! I wish you could leave 7 likes too! I’m glad you enjoyed the post. It was nice to be a little more laid back on this one.